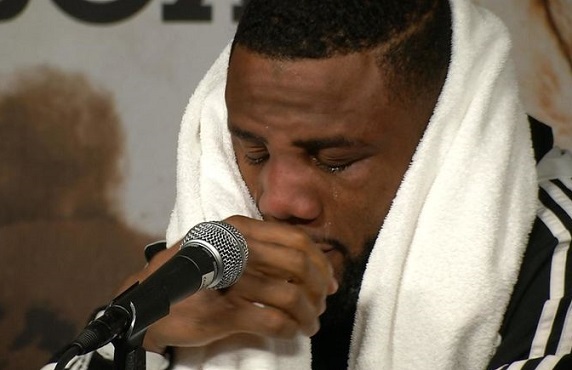 Jean Pascal appeared devastated and inconsolable and Freddie Roach was incapable of explaining what had just happened beyond stating the obvious. It was a poignant moment at the post-fight press conference as the challenger and former light heavyweight champion hid his face in a towel and Roach did his best to put some kind of upside on a ruinous defeat. 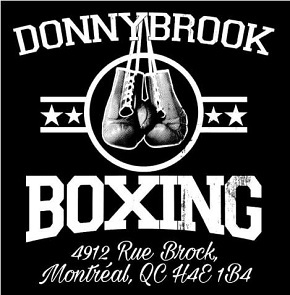 Montreal, a city filled with old stone churches, was once known as “The City of Saints” and indeed last night Jean Pascal fought like a Christian martyr, feebly allowing Sergey Kovalev to repeatedly corner him and hammer home powerful punches before Roach called a halt after seven one-sided rounds. The crowd at the Bell Centre, which a short while before had passionately cheered for their hometown hero, quietly walked out of the arena as if exiting a hushed cathedral after a long, dreary funeral. An emotional Pascal at the post-fight press conference. In the end, there was the inescapable sense of a swindle being perpetrated on someone, somehow, as the rematch failed to live up to all but the most pessimistic expectations. 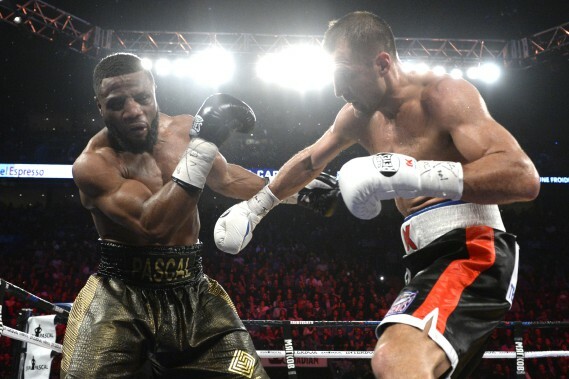 The tagline for the bout, “This Time It’s Personal,” implied that the second time around we would see a Pascal more motivated and better prepared to confront the challenge that is Kovalev, surely one of the most dangerous boxers, pound-for-pound, in the world today. 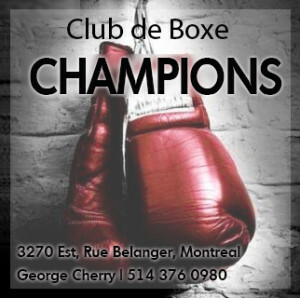 Backing up that claim was Pascal saying au revoir to longtime coach Marc Ramsay and taking up with Roach, generally regarded as one of the top trainers in the sport. The first fight had been a highly entertaining scrap with Pascal holding his own and even coming back from a near stoppage to land big punches and win rounds. 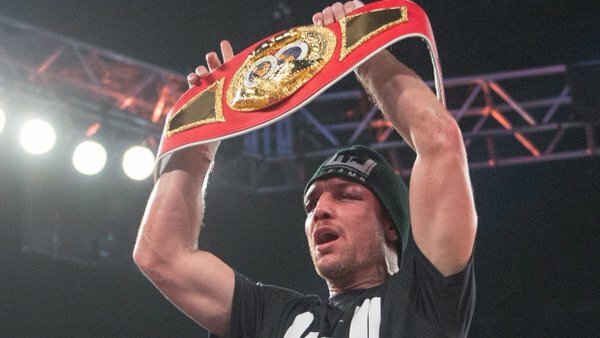 The only reason to look forward to a rematch was if one believed the former champion could, with Roach’s help, learn from that first encounter and build on what success he had enjoyed before Kovalev’s power decided the outcome. Any such belief proved baseless last night. Perhaps Pascal is the victim here, either of his own hubris or of Roach being overly optimistic about his new fighter’s abilities. Little light was shed by the famous trainer as to what he intended to have unfold. Roach stated there were “no excuses,” that the deciding factors were Kovalev’s power and Pascal’s inability to put the Russian on the back foot. Presumably then the strategy was to take the fight to the champion and put him on the defensive with speed and sharp punches. How could it be obvious to everyone but Roach that asking Pascal to succeed with such a battle plan was akin to sending a Christian out to face the lions in the Roman arena? The challenger failed to win a single minute of the fight and in the last few rounds he meekly soaked up punishment like a masochistic martyr. But if the Pascal faithful at the Bell Centre felt cheated by false expectations and empty hype for a rematch that offered none of the excitement of last March’s first encounter, they could take some comfort from the fact that they had still witnessed something special, indeed, the kind of galvanizing duel which goes some way to redeeming this brutal sport. While those watching on HBO in the U.S. had to settle for a one-sided and rather tedious win for Dmitry Mikhaylenko over Karim Mayfield prior to the main event, the thousands on hand at the Bell Centre saw a tremendous war between two local fighters in a classic crossroads clash. 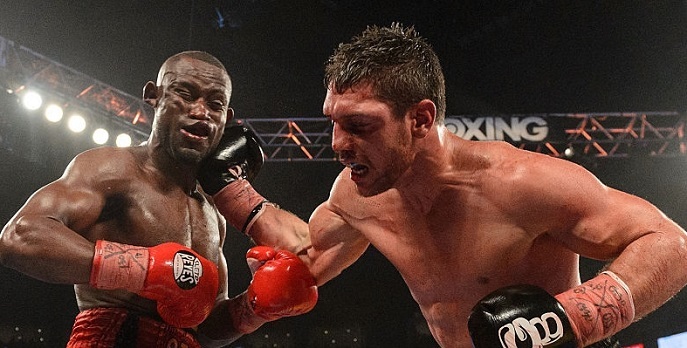 Francis Lafreniere and Renan St Juste stole the show last night in violent and dramatic fashion and if there’s any justice in the world both they, and the astounding ten round donnybrook they gave fight fans, will gain widespread recognition. St Juste and Lafreniere go to war. For those who have seen Lafreniere in action before, the nature of the battle came as no surprise. The gutsy warrior from Saint-Clet, Quebec is a relentless brawler who maneuvers as if the top of his head has a magnet which must be immediately attached to his opponent’s face or chest. Ceaselessly driving forward, he then pours in punches from all angles as he wears the other man down by virtue of sheer pressure and attrition. 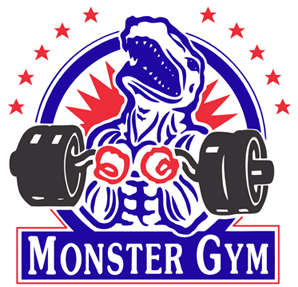 Lafreniere’s conditioning and physical strength allow him to make the most of this style, though the price paid last night should encourage him to further develop his defensive abilities, or else the career of “The People’s Champ,” who is also the Canadian middleweight champion, may prove short indeed. St Juste, who also gave an astonishing performance, especially considering he is 43 years of age, was successful at times in finding punching room and blunting the younger man’s attack, but for the most part spent his time with his back to the ropes, slugging away. It was clear he had the edge in power, but by the middle rounds it was also obvious he was having difficulty maintaining the frenetic pace. Most of the rounds were extremely close but Lafreniere won several of them in the final 30 seconds when a fatigued St Juste was looking for the bell and found himself backed up and smothered by his tenacious opponent. Lafreniere appeared briefly stunned a couple of times by heavy power shots, but never looked badly hurt. He sustained a deep gash over his right eye, which the referee had examined by the ring doctor more than once, but which proved a minor factor, though by fight’s end both men were glossed in crimson. Every round was close and hard-fought but in the majority St Juste was outworked by a slim margin and at times staggered by the velocity of Lafreniere’s attack. It was a case of the more powerful and experienced boxer being overtaken by the unrelenting aggression of the younger man. 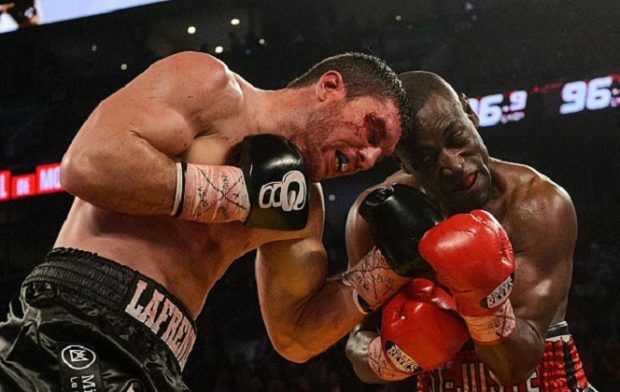 Near the end of rounds nine and ten it appeared a stoppage win for Lafreniere was within reach, but St Juste refused to go down even as his legs bent and buckled. At the final bell the two warriors embraced and the crowd rose to its feet and roared in a lengthy and thunderous ovation for both men. It was a thrilling battle, as well as a remarkable display of courage and physical sacrifice, and all present knew the chances of the main event matching it were pretty much zero. 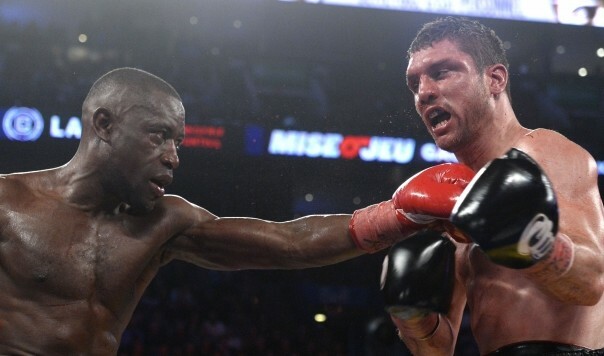 As it turned out, both Mikhaylenko vs Mayfield and Pascal vs Kovalev II were watered-down near-beer compared to the potent, cask-strength single malt that was Lafreniere vs St Juste. Their war stole the show, even if those watching on HBO had no idea, the network picking the wrong undercard fight to feature on their broadcast. This writer was given a unique glimpse into the high cost Lafreniere pays for his crowd-pleasing style when he was allowed access to the victor’s dressing room immediately following the bout. Exhausted and hurting and with blood streaking his arms and legs, Lafreniere slumped on a bench as his handlers tended to him and cried out in pain when wet towels were applied too roughly to his swollen face. Minutes later his hard-won IBF Intercontinental belt was brought to him and, as he cradled it in his bruised hands, he burst into tears of relief and exhaustion. Lafreniere holds aloft his new belt. Kovalev affirmed that he did indeed wish to punish and torment an opponent who he regards as a “not-good person” and a “trash talker.” “I wanted to punish him for his bad words,” he told the press, adding he was certain he broke the challenger’s nose. But Kovalev also stated that he appreciated Pascal coming to him and offering his congratulations and that the two fighters then shook hands. Considering all the bad blood stirred up by Pascal’s pre-fight talk and his antics at the press conference on Wednesday, this was welcome news.